The Abbott And Costello TV Show was a 30 minute comedy series that aired in syndication during the 1951/1952 and 1952/1953 seasons. It was about two out of work actors who lived together in a boarding house. The scripts included the same slapstick comedy, puns, and other elements that audiences loved in Abbott & Costello movies. What routine thrust Bud & Lou into stardom when they first performed it on the Kate Smith Radio Hour? Which fast food chain used their "look-a-likes" in their commercials? Abbott and Costello appeared on the 100th episode of a very popular comedy show on March 22, 1953. Which one? They once raised $89 million in just three days! What was the money for? In what year did Abbott & Costello first work together? What major comedian with his own show in the 1990s said that Bud & Lou where a major influence in his career? In 1939, Abbott & Costello signed a movie contract with which movie studio? What honor did Bud & Lou receive on the Steve Allen Show in 1956? What were the boys real names? In what year did the Abbott and Cosello Show begin? Did you know that before the TV show, there was an Abbott & Costello radio show that aired from October 8, 1942 through March 26, 1949? Note: As this series was broadcast in syndication, Air Dates varied from station to station and, therefore, no original airdates are listed. McDonalds used them to advertise their "combo meals" in 1993. The Colgate Comedy Hour, hosted that evening by Bob Hope. 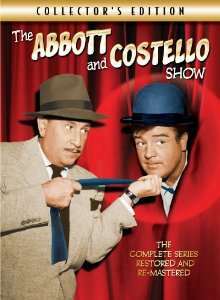 Abbott & Costello also hosted that show on several occassions as did other great stars like Martin & Lewis, Frank Sinatra and Fred Allen. War bonds. And they paid for the war bond tour out of their own pockets! 1936. They began by working the Burlesque circuit. Jerry Seinfeld. Jerry also hosted a 10-hour marathon of their comedy on the Comedy Channel and appeared with them (through the majic of computer manipulation) in a special show on NBC called, "Abbott & Costello Meet Jerry Seinfeld". Universal Studios where they made, "Buck Privates", "Naughty Nineties", "In The Navy", "Time Of Their Lives", "Abbott & Costello Meet Frankenstein", "Hold That Ghost" and others. 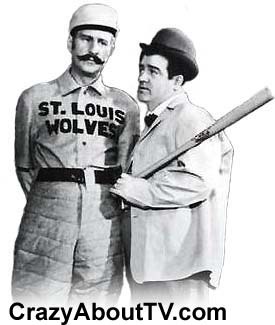 Abbott and Costello became the first non-baseball celebrities to be inducted into the Baseball Hall Of Fame for their performance of "Who's On First?" Bud was born "William Alexander Abbott" on October 6, 1897 and Lou was born "Louis Francis Cristillo" on March 6, 1906. Thank you for visiting our The Abbott and Costello TV Show page!